When you endeavor to fix the broken world your efforts, if earnest, will also help to fix you. On July 12th of this past year, my beloved husband, David, died after a long and courageous battle with cancer. He was just 57. His death left me, and our children – Lev and Shayna who are Schechter alumni – devastated and heartbroken. David was a devout Jew and observant of the seminal Jewish command of Tikun Olam — the responsibility of every man to heal the broken world. The notion of Tikun Olam informed David’s life and the choices he made, especially in his professional life. David was a Harvard Law professor and the director of the Harvard Legal Aid Bureau. His specialty was poverty and housing law. For twenty years, he trained hundreds of law students to effectively protect people from being unjustly evicted from their homes and he along with his students provided free legal representation to thousands of clients in court. David also developed a partnership with CityLife Vida Urbana – a grassroots organization in Jamaica Plain that fights against forced homelessness — and with CityLife and his students protested and marched in the streets for fairer treatment of the poor. David drafted and got passed legislation to protect people from being unreasonably thrown out of their homes, and his cumulative efforts raised national attention — through media coverage in newspapers and on news programs — of the foreclosure and eviction crisis that started in 2008 and continues to this day. Shortly after David died some of his former students and colleagues asked if I would help them establish a fund in his honor that would support law graduates, who like David, wanted to forge a career in fighting for equity and fairness for the indigent. Because I know that there is a real need for this kind of funding, I said yes and the David Abraham Grossman Fund for Social Justice – I call it the DAG Fund for short — was born. But soon after I said yes, I started to have regret and worry. Could I, broken by grief and loss, engender support for my cause? Can a broken person help to fix a broken world? I reached out to friends to tell them about the fund and asked for help. And I immediately got an outpouring of positive response and lots and lots of offers of lunch and coffee to chat and brainstorm. One friend knew of two different women who started funds after the tragic loss of their children and arranged for me to meet with each of them. And so I met with Roberta Carson who created the Zach Carson Memorial Fund in memory of her son Zach who died at the age of 19 from diffuse intrinsic pontine glioma, a rare brain cancer. Her fund, which has raised nearly $1 million dollars, supports research for a cure to this deadly pediatric cancer. Roberta told me that when her son was diagnosed there was no research being done to understand the disease and so there was also no treatment. Her efforts are changing this narrative. I also met Blyth Lord, whose daughter Cameron died from Tay Sachs disease at the age of two. Blyth founded the Courageous Parents Network which provides counseling and emotional support to families whose children have terminal illness so that they can be well equipped to navigate their anxiety and grief –filled journey as they provide nurturing care to their dying child. What an honor it was for me to meet Roberta and Blyth. Their stories, as well as their strength and resilience to create good out of devastation, was a great source of inspiration to me and so I did my best to follow their very impressive example and got to work on the DAG Fund. I reached out to family and friends and asked them to make a donation. 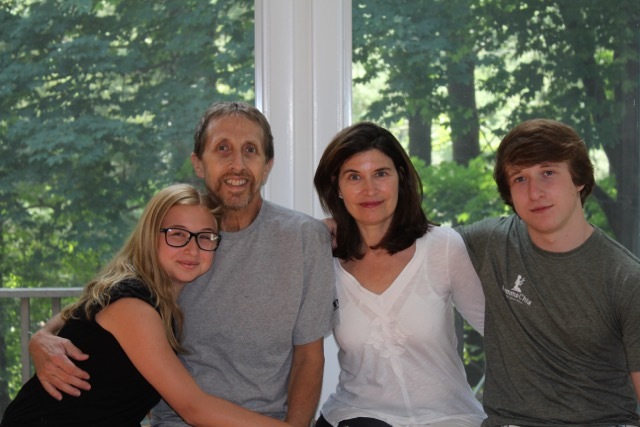 With the help of David’s former students we created a website so that folks could learn about David and the fund and if they wanted to, could make an online donation. But I needed to extend my outreach beyond family and close friends. So, I called the head of Horace Mann, the high school my husband attended, and successfully lobbied to get the mailing list of his grade and sent out solicitations. Through Facebook, I was able to connect with some of David’s college roommates and friends and I asked for their help. I summoned the courage to speak with a former colleague of David’s who is a partner at a private law firm and asked him and the members of his firm to support the fund. And, I spread the word about the fund to David’s former students and colleagues at Harvard. Through this outreach I received many donations to the fund, and I also got to hear testimonials, stories and heartfelt memories from people who knew and admired David. Each donation and each story was like a salve to me. I discovered that the more I connected with others, and talked about David and the importance of his work, the more I developed a sense of gratitude and pride about my efforts. I want to share with you one of the many stories about David that I got to hear as I worked to raise awareness and support for the DAG Fund for Social Justice. She explained that seven years ago she came to a CityLife meeting because her home was in foreclosure. She recalled being ashamed and humiliated at the time and just wanting to leave the meeting. But shortly after she shared her story with City Life members she was introduced to her attorney, David and his son Lev. They would be helping her. David did much to assure Susan that her shame was not warranted and that she had done nothing wrong. He told her that her foreclosure was illegally conducted along with thousands of others in Boston and that he would fight with her for as long as he could to keep her in her home. David did fight for Susan and through lots of legal tactics and effort delayed her case for five years. When her case finally came to trial he lost. But David was not done, he knew Susan was on the right side of the law and so he urged Susan to file an appeal. Susan agreed, but David was too sick to continue to be her lawyer, so he asked a former student, Julia, who was working as a full time poverty advocate at the Legal Services Center at Harvard, to work with Susan on her appeals case. After two years of legal battling in the appellate court, and seven months after David’s untimely death, Susan on that winter’s night this past February announced before all of us at CityLife that her case was overturned and her home was now legally hers again! Lev, Shayna and I were elated for Susan and extremely proud of David and Julia’s valiant and successful efforts. I posted the victorious news on the DAG Fund Facebook page and over 1,000 people viewed our post. In the months since then, I have continued to work hard on behalf of the fund. I have spoken at events, like this one today, shared my story, have met intelligent, inspiring people, learned a lot about the impact of my husband’s professional legacy, and have raised $350,000 for the DAG Fund thus far. And, I am proud to tell you that an incredible Harvard Law School graduate, Joseph Michalakes, who is devoted to providing legal advocacy to those facing evictions and foreclosures has just agreed to become the first David Abraham Grossman Fellow. There is nothing more gratifying, more soul healing and elevating than knowing that through Joey’s work I will be continuing my husband’s work, his narrative, his legacy. And so, I believe: When you endeavor to fix the broken world your efforts, if earnest, will also help to fix you. Middle School students have a unique opportunity to hear from members of our community in a special program called Ani Ma’amin, This I Believe. Our guests speak about their core beliefs.